Every business needs a website these days. If you find that yours is generating a good number of visitors it may be time to think about how the website itself could generate additional funds. Affiliate marketing can be a very simple solution that takes very little time to put into practice and could generate a trickle or even a steady flow of extra income. In a nutshell, affiliate marketing comprises of links or promotions where you are paid a commission for every time a user of your site clicks the relevant link and makes a purchase. Joining an affiliate network makes things even easier – you’ll have the option to join a wide range of relevant affiliate relationships all in one place. Whatever line of business you are in, you will have some genuine products that you’ve needed to use and that you would recommend to others. Some of those will be obvious, such as cameras for wedding photographers, door and window manufacturers for architects maybe. But everyone who runs a business can also recommend basic business services, like printing, web hosting etc. You could also suggest books and music that you find particularly inspiring. The Amazon Associates programme is good for those small items – and you’ll get commission on any other purchases the customer makes within 24 hours of clicking through from your blog. Put your recommendations together with details of the product and why you recommend it, with a link through to the affiliate programme. You could set the article up as a tab on the homepage of your website. If you have a blog you may find that you mention various products as a matter of course in your updates. That’s integral to some industries, like fashion, beauty and food. Whatever industry you are in, a blog is a great way to keep your website fresh and up to date. It makes you think broadly about relevant topics that can help drive more traffic to the site. Affiliate marketing can add even more value. 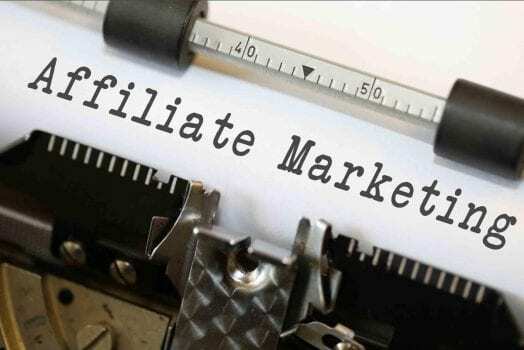 So for example if you have explainer articles or videos and mention associated products that you don’t sell yourself, then make sure that you include an affiliate link. Review articles are another approach that customers really appreciate and that can generate good traffic. Even better if you can include lots of photos or video. You also might find that companies will be prepared to give you one of their products for a review as well. Keep focusing on relevant products or services that genuinely sit well within your existing web content. Ideally, opt for niche items which tie in with your existing business strategy. If you go crazy and link to a myriad of products that have no relationship with the focus of your site, you will confuse Google, who won’t know what your site does anymore and will downgrade you in their ranking as a result. An affiliate network is a platform that manages affiliate links for a large number of products and services. It’s a one-stop shop if you like. As a website owner, you join the network, put in your payment details and then ask to join the various affiliates who are members. There are a number of networks, including Topoffers.com, AWIN and TradeDoubler. You can of course join them all or if you want to keep things streamlined chose the one that includes the businesses you most want to connect with. There is generally no charge for joining as the platforms make their money from a micro-slice of the affiliate fee. Social media can be used to promote your content further. Just make sure that you keep the balance right between being an expert in your field and being salesy. If you’re promoting an article that’s fundamentally useful and the affiliate link is an integral part of it, then that would be fine. But if you’re just sending out affiliate sales links, you could be in danger of damaging your brand. Identify the social media channels where your customers are mostly likely to hang out and channel your new content onto them. You can set-up automated feeds for new blogs to post on social media without you having to do any extra work, or you could re-purpose the content in chunks that make sense on the various platforms. And don’t forget email; for some groups it’s still the most popular form of communications and they may well appreciate your blog updates in the form of a regular newsletter. Keep an eye on your user statistics to learn what works and keep improving. Small changes can make a big difference. Google analytics is your best friend when it comes to tracking outbound links. Good affiliate networks will also provide you with a data centre, showing the number of clicks, conversion rate and purchases. A high commission rate may be tempting, but if it doesn’t result in many sales, it may not be worth your while. After a short time you will find the products with the best level of clicks and conversions for your website and customers. Or if you find it’s not worth the space on your website, it will have been a useful experiment and you can take those links off the site in no time at all. For some, affiliate marketing works so well that it becomes the core of the business. You’ll never know unless you give it a try.